The panel control is used as a container for other controls. A panel control is very handy, when you want to group controls, and then show or hide, all the controls in the group. Panel control, is also very useful, when adding controls to the webform dynamically. We will discuss about, adding controls dynamically using panel control in the next video session. In this video, we will discuss about, using the Panel control to group controls, and then toggle their visibility, using the Panel control's Visible property. The following webform is used by both, an Admin and Non-Admin user. When the Admin user is selected from the dropdownlist, we want to show the controls that are relevant to the Admin user. When the Non-Admin user is selected, only the Non-Admin specific content and controls should be shown. HTML of the ASPX page. At the moment we are not using Panel control. <asp:TextBox ID="AdminActionsTextBox" runat="server" Font-Size="Medium" TextMode="MultiLine"
Text="There are 4 user queries to be answered by the end of Dcemeber 25th 2013." Code-Behind code. Since we are not using the panel control, each control's visible property need to be changed depending on the selection in the dropdownlist. HTML of the ASPX page. The panel control is used to group the controls. I came across your site by mistake. After watching some ASP.Net videos I was wowed. There are many YouTube videos on this subject,but very few in depth like yours. Later how about building a real practical world application using ASP.Net. An application which shows how all this is put together in a real practical way. Hi, Thank you very much for the feedback. That's exactly my next step. You just spoke my mind. After I am done discussing the concepts. We will work on a practical application utilizing the concepts discussed. Thanks a lot for taking time to feedback. Hi..from the USA here. Did you work on a practical application utilizing the concepts discussed? I would love to have it. Great Job... Are you going to work on topics that are more advanced. I really need to have that and am sure lots of people wants it. I was doing good till the mid level of technology. Now its getting bigger and tougher.Any help would be really appreciated. 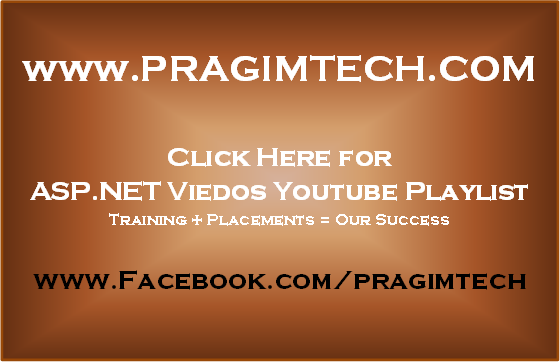 I searched hours and hours to find C# tutorials and find Pragimtech after listening them i also listen your Asp.Net tutorials and honestly i learn a lot about .net technology and got job in Asp.Net. Hellow sir,,all your videos are awesome to listen and i get a lot from them.